I'm trucking around the house in my pjs and slippers over Christmas because I have a cold, a nasty cold. I drank gallons of tea and hot cocoa and chicken noodle soup. Blarg. The main sewer line had backed up a bit into the house so there was limited use of water until it could be rodded out on the 26th. I found something to do with myself (See post below. ), but I spent some time cleaning the room where the litter boxes are. Still, there seemed to be this crunch, crunch when I walked around that I couldn't eradicate, no matter how many times I went over the floor with a broom. It was getting on my nerves. Hamlet is terrible about digging in the litter. It goes flying and winds up outside the box, but there wasn't a lot tracked through the house. What was making this crunch noise and the feeling, underfoot, that the floor wasn't clean. I looked at the bottom of my slippers. Well, to be honest, I have had these slippers for, gee, maybe 8+ years. I loved the hard sole. I would wear them to get the mail or take the recycling to the can. They were comfortable; oh were they comfortable. But this would explain the crunch and why things didn't feel right. It was a sad day to toss them in the garbage. I have a pair of Hawkeye slippers which I've had now for a couple years. They do not have the sturdy sole shown here, but a slim hard plastic. They are comfortable, but they have stretched to allow the wearing of a sock. When I get out of bed in the morning and want to wear slippers, my bare feet walk right out of them. They are great for during the day; warm and cozy; but they just don't fit anymore. I needed new slippers. Thank goodness for after Christmas sales. I give these Isotoner slippers from JC Penney 5 stars. They are incredibly comfortable. They are true to size and fit perfectly. I've worn them with and without socks, but they are my 'go to' in the morning. 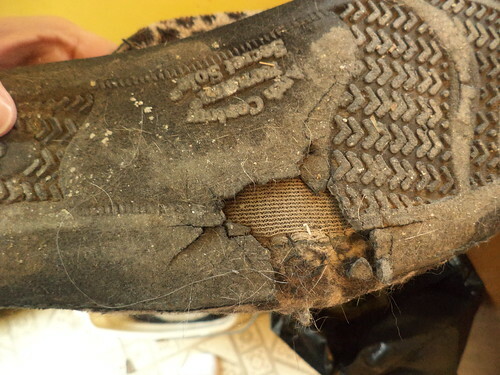 They have a hard sole exactly like the ones which disintegrated. There were leopard print slippers on the web site, but only in small size. I like these. It got me thinking about the new year. I haven't been a very good blogger. After posting in October, we got swamped with a huge inspection job and I wound up doing most of the work. After that came the write up of the reports. Add a splash of a vacation in Virginia over Thanksgiving. Stir in a heavy cold and two holidays and posting here was the last of my thoughts. Yet, I did come up with something on my Facebook feed which I'm going to share here. Here is my advice for starting 2017. I had to get new slippers because my 10+ year old ones with the hard sole broke. 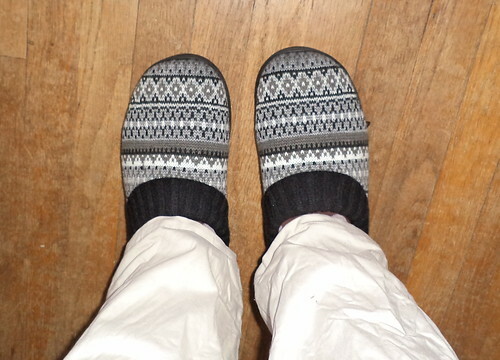 They were very comfortable and slippers are kind of a personal thing. Thanks to after Christmas sales, I got a pair of "memory foam" slippers from JC Penney for $13.00. Folks, if you are having a really bad day, feeling like life is against you, check your shoes. Are you wearing comfortable shoes? I mean, really comfortable? If not change your shoes. Go find a pair you can live in, really live in; wear 18 hours a day. In the late spring through late fall, I'm not in shoes when I'm at home. I prefer barefoot, but these slippers are amazing. I have other shoes (Clarks) which are just as comfortable. Ya gotta move through life. You can't be standing still. Make sure you have comfortable shoes for your journey. That's my advice. So, amongst all the canned words which have filled your email or Facebook, trying to be inspiring while not glib or eye-rolling, this is what I give you. Wear comfortable shoes.